Based on the findings of the study, the following recommendations can be made for AusAID Cambodia and other international development agencies engaging in the health sector in the country. At the time of writing, it seems likely that HSSP II will be extended by one year, with the start of 2015 most likely to be the starting point of the next phase of AusAID support to the sector (Pearson, 2012). The following recommendations represent principles and ideas which could help guide the overall approach for this next phase of programming. 1. Effective support for Cambodia’s health sector may involve designing elements of programmes to ‘go with the grain’ of political economy dynamics. This has the potential to have a high impact on health outcomes. a. Attempting to work with the trend of mass patronage, by encouraging health to be seen as an appropriate ‘gift’ to constituents (e.g. disbursing vaccinations, dietary supplements, medicines), would be likely to garner the required behind-the-scenes approvals and ownership which could see broad, fast and effective roll-out with minimal leakage. b. This could involve providing funding and/or in-kind resources for relatively top-down, one-off solutions to certain problems – for example, vaccinations, bed nets, or nutritional supplements. Key local government actors (and possibly CPP working groups) should be engaged, and it would be important that there were space for government and/or CPP to claim some credit for handouts. The issues of branding and publicity would need to be carefully considered. c. Patronage-based distribution helps trickle down resources and allow for services to reach local people to some extent; yet it is far from being systematic and equitable. Complementary activities could be carried out to compensate for the downsides of mass patronage. One important priority would be public education and awareness to make the demand for health services better informed. Mitigation should be made for areas which are under-prioritised by the patronage system, for example through ensuring that NGOs focus service delivery on areas with low political priority. d. Programmes could limit downsides through making gifts selectively available – for example, on issues where citizen demand is more likely to coincide with good medical advice, and by making the volume of gifts available proportional to the burden of disease or magnitude of the problem. e. IDPs may want to limit their exposure to risk in such a programme through focusing on impact. Although it may often involve a ‘second best’ response to problems, the nature of handouts means they are suitable for conducting highly rigorous impact evaluations, which would establish improvement in health outcomes attributable to the programme, with a high level of certainty. Full randomised control trials are unlikely to be possible given the (required) lack of control over disbursement; however a variety of quasi-experimental methods should still be able to establish the value of the programme beyond reasonable doubt. 2. 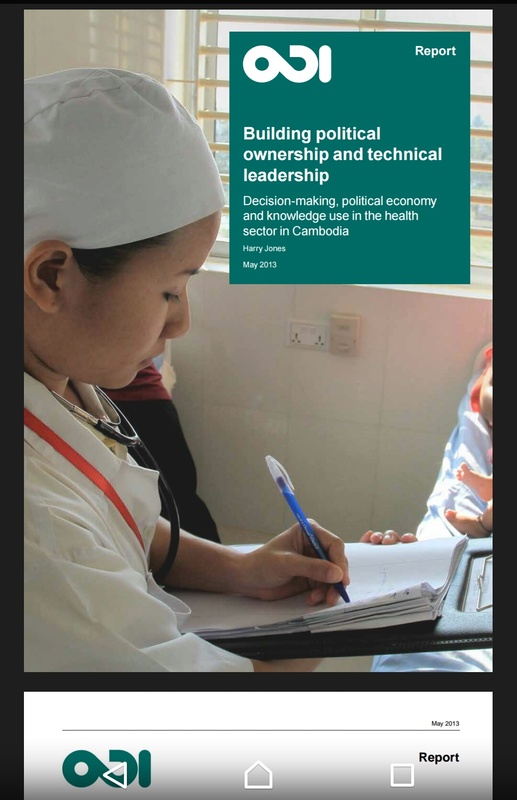 It should be recognised that medium- to long-term prospects for sustainability and effectiveness in the sector hinge on whether greater political ownership by the Cambodian government(15) can be built over health service delivery. a. IDPs should formulate a basic theory of change and some principles and assumptions relevant to Cambodian context about how political ownership can be built in the sector. From that, they should identify strategic entry points or issues on which it is acceptable for them to work, or where their programmes can in some way contribute to health sector programming. b. Some plausible elements of such a theory could be: increasing the extent to which the CPP sees health as a viable ‘gift’; raising awareness about health ‘gifts’ building expectations for the Government to deliver on the part of Cambodian citizens; increasing the perceived importance of health by key levels of government and the general public; supporting the ability of government to systematically manage and deliver services and health outcomes. c. As well as potentially targeting programme support around a top-down ‘gift-giving’ dynamic, the other major entry point is the ongoing decentralisation reform, and the way the health system joins up with local government. d. Goals around government ownership are as important, if not more so, as ‘good governance’ and fiduciary issues, which should be approached with pragmatism (‘good enough governance’ may be the most appropriate mantra). It is likely that successful, visible delivery of health services, combined with an increasingly healthy and able population (over a demographic timescale), are much more likely to lead to long-term transformation, not just in human development indicators, but in the ability and willingness for Cambodians to hold their government to account. e. Support could work better and donors’ political risk could be more easily managed if programmes revolved around strong outcomes and impact goals, and were realistic and flexible about how these were achieved. The health sector is lucky to be suited to objective assessments of needs and of the impact of programming, and programme design efforts should draw on impact evaluation expertise from an early stage. a. It is imperative that IDPs make clear and explicit decisions about the extent to which they are aiming to promote governance and institutional change, and the extent to which their focus is on promoting health outcomes for poor Cambodians. b. In the authors’ opinion, a realistic approach would jettison any hopes of making inroads to broader systemic trends around rent-seeking or issues around politics and accountability, from what is a marginal sector. It should recognise the fact that these issues are comparatively small in health, compared to other sectors. It would also understand the limits of technocratic governance and accountability reforms pushed by external actors in the absence of any strong domestic demand for this in the near future, or stronger government ownership of effectiveness in health. c. Rent-seeking and corruption can be tackled in the sector, but a flexible, opportunistic and responsive approach is needed. Rather than making a series of non-negotiable demands and conditions, IDPs could prepare to change focus if it appears that vested interests and behind-the-scenes deals block the way in one area. Achievable institutional and governance goals are incremental rather than idealistic, recognising the likelihood of policies which appear ‘perfect’ on paper but lack resonance in local context. d. An ‘outcomes-based’ funding mechanism could put in place a beneficial incentive for reforms, given the importance of donor funding to the sector. A menu of desired changes could be laid out with associated budgetary tranches to be released in response to not only policy changes but actual indicators of outcomes and behaviour change. This could be used as one tool for donor coordination, with different partners assigning different levels of funding to different options, according to their own priorities and fiduciary risk tolerance. Supporting existing Cambodian organisations to produce policy-relevant research and make links to policy b Intermediaries: Supporting intermediary organisations to help link knowledge and policy c Demand: Building the demand for and capacity to use research on the part of the Government. a. Funding should be provided for domestic research on health. Incentives could be provided to encourage researchers to communicate their work or otherwise engage with policy and practice. A small fund could be provided to support fast, reactive research to emerging government priorities in the sector. b. As much as possible, research commissioned by IDPs and others may benefit from fitting within existing policy and implementation frameworks. Stocktaking studies could be commissioned by IDPs to ascertain the knowledge base on certain issues. c. It is important to recognise the role IDPs have in potentially fragmenting domestic research capacity through too much work being carried out in ‘consultancy mode’. This would mean being prepared to provide some level of core support to policy research organisations, and potentially setting aside a fixed proportion of the money spent on international consultants to go towards strengthening national capacity in this area. 6. On intermediary functions, a major effort needs to be made to consolidate knowledge and lessons learned across project implementation. It would seem that the ideal home for such a facility might be MEDiCAM, which is already established as the umbrella organisation for health NGOs. a. A facility should be set up to make comparisons across pilots and NGO projects in similar or related areas. It should synthesise lessons learned, and provide a neutral, independent review. Its function could be strengthened to make comparisons across pilots and NGO projects in similar or related areas. b. It should create incentives for adaptation and learning. This could be done by focusing both on rewarding success (e.g. prizes for innovative practice or independent scores for projects) and providing support for lagging initiatives (e.g. having flexible technical capacity to deploy where needed). c. Facilitating networking and peer-to-peer learning would be crucial as well, using study tours to successful projects and borrowing staff from successful projects as ‘consultants’ to new ones. Interaction and discussion could be facilitated through online discussion platforms and workshops or conferences. d IDPs could provide specific financial support for establishing a depository centre for documents, reports and policies in the form of a physical library and/or a web-based library. 7. The demand for and use of knowledge could be enhanced. a. One approach to this could look to build government engagement with and coordination of research in the sector by setting up a ‘contact group’ in the MoH who would be informed from the design stage of donor commissioned studies and, given space, input into research questions and management of the work, and provide feedback into reports. b. More ambitious, such a group (with the involvement of key decision-makers) or another unit in the MoH could be supported to define the ‘knowledge agenda’ for the Ministry. This would look at recent trends and upcoming challenges, potential policies and programmes, and identify key areas where more knowledge is needed over the next five years; it would involve a series of consultations as well as scoping studies and horizon-scanning. c. Another approach could be to support an exchange scheme for key managerial and technical staff. Sending key Ministry or provincial staff to secondments in similar positions in other ASEAN countries or other developing countries would not only provide a welcome incentive for such staff to hold the post, but would likely greatly improve their capacity, and in the long term, broaden the technical capacity within the sector and widen the pool of potential decision-makers. The success of the Phnom Penh Water Supply Authority is partly attributed to such secondments. 8. Possibly the most important priority for linking knowledge and policy is at the decentralised level; this also represents a promising entry point for improving health outcomes. Given the positive trend of decentralisation and the likely window of opportunity to set new relationships, this is an urgent priority for action (and assessment – a more focused study is needed to assess the best level of engagement). a. Efforts should be made to make the annual operational planning process more suitable for facilitating decentralised decision-making. From our interviews, there seemed to be some demand for cutting back on the largely paper exercise, to reduce bureaucracy. Reforms to the system should focus on building devolved responsibility for planning, assessment and reporting, allowing provinces to set their own goals, and report on their own terms by their own methods. b. It is important for IDPs to provide on-demand and flexible technical assistance for provincial level management of health. c. Efforts should be made to facilitate links between directors of health and provincial governors. Spaces for deliberation, decision-making and management could be set up to convene key actors from the health system and local government structures. Provincial health directors could be given leadership training. A nominal figure should be selected – it will necessarily be arbitrary, but experience elsewhere has shown that putting a number on research communication helps enormously regardless of the true value – and then a small campaign led within the donor community could contribute to the pot. Schon (1973) has shown how this system in some contexts has helped generate a great deal more enthusiasm and commitment to change, and ultimately was a key factor in the success of the programmes. d. Some of these activities need to begin as soon as possible; for example, technical assistance and brokering links between the health system and local government. Others need to be flexible and respond to the emerging process of design and development. e. To complement this, IDPs could work with central organisations to develop and clarify the roles of the MoH and MEF in health delivery. Functions such as overseeing needs-based distribution of finances, and supporting and rewarding performance could be envisaged for the MoH. As well as using the above for guidance in formulating the next phase of support, there are a number of things which can be done before 2015.
a. It is quite urgent to conduct a study of decision-making and political economy at decentralised levels – to review experiences to date and suggest the most appropriate levels and modalities for linking health and design and development. This should assess not just issues around functional assignment, but around engagement and relationships between key actors at these levels (e.g. between district governors and health officials). b. Depending on the findings of the study, it could be opportune to put in place some support for health at the decentralised level before the full successor to HSSP II is in place. Areas might be support for leadership and capacity building, institutional strengthening and innovation, and improving evidence-informed management at this level. Support would need to be flexible enough to react to demand and leadership where it emerges. a. There is an urgent need for a detailed political economy analysis of staff incentives and salary supplements in the health sector, especially in service delivery, to inform IDP support. b. An issues-focused political economy study could be carried out on nutrition to identify the most realistic and appropriate entry points and measures. c. CPP or ex-CPP members, or researchers who are knowledgeable and well connected to the CPP, could be employed to write a think-piece on how to improve political ownership over health services. a. Commissioning studies on issues of specific interest and importance (suggestions for these above). b. The design of key programmes and instruments should incorporate review and inputs by a political economy expert. The ‘theory of change’ and intervention logic must be based on a sound and realistic understanding of political economy issues. c. The identification of project partners and potential ‘champions’ in government also needs to be informed by a political economy analysis, to ground engagement in a realistic understanding of the modus operandi of different actors (Hughes and Hutchison 2012). d. Establish a small ‘reference group’ of experts (international and domestic) on political economy in Cambodia, perhaps on a draw-down contract, to use as a resource for key issues and decisions, at important junctures and crises, for ongoing advice and inputs to programming. a. At a minimum, this should involve looking to understand the CPP perspective, and plans and interests on the sector. This could be done through the suggestions for improved political economy analysis mentioned above. b. A more involved step would be finding individuals. Engagement with the CPP might involve strategic partnership with key CPP members, or people who have connections within the CPP who are prepared to discuss such matters with IDPs. They could be used to provide informal channels to test specific development ideas with CPP members, or to suggest actions on one side or the other. c. A more involved approach could be active dialogue between IDP programme staff and key parts of the CPP hierarchy, if this were politically acceptable. Relevant CPP members could be invited to workshops to provide input to programming, or to explain requirements and programme needs. Exactly how to do this would need to be discussed on a case-by-case basis, with support possibly from the reference group. d. Particular attention should be paid to how IDPs can work to influence budgetary commitments for the sector at various levels, and early engagement should be made with the key individuals and committees prior to key moments in programming cycles. e. There should also be very careful attention paid to issues of publicity and branding of IDP efforts, and the framing of sector assistance. a. One measure could be more careful planning and monitoring of interactions with key sector individuals, coordinated (if possible) across IDPs operating in the sector. Drawing on good practice from fields such as lobbying and negotiation, simple tools could be used to track meetings and engagement with individuals. b. Partnership and influencing approaches should be differentiated between technical staff and more political appointments (with the proviso that this categorisation represents two ends of a spectrum, rather than two unique ‘types’), recognising the strengths and limitations of each. c. Technical staff are more likely to take on board messages from research and analysis, but may have limited ability to undertake more political tasks such as dividing budgets. This could mean IDPs would be prepared to offer them ‘cover’ for such tasks, and allow any ‘blame’ to be commonly attributed to them, where it might strengthen the hand of key allies. d. Political appointments should be approached differently. Successful programme intervention requires the attention of high profile political individuals within the power hierarchy. Lessons from the experiences of changing maternal mortality policies suggest that a strategy of ‘stepping up hierarchies’ can be effective: inviting staff in influential positions to attend an event, in the hope that they will bring a superior to the next event, who may then, in turn, bring their superior. Influencing these kinds of individuals is likely to require IDPs taking a back seat, giving prominence to Cambodian ‘champions’, and brokering practical knowledge and voices of experience. a. Finding ways to ensure that key studies are published is a priority. This issue should be discussed from the outset of a research project and actively followed-up on completion of the work. b. Ensuring all major studies and consultancies produce short policy briefs or ‘good practice’ notes is essential. These should be published in both Khmer and English, and disseminated in a targeted manner according to a simple but strategic communications plan. c. To get government attention and cooperation in any research, IDPs should demonstrate their plans/commitments to provide resources to address the issue under the planned study.